Among the pleasant and truly successful men in Nez Perce, we should mention Mr. Bowlby, whose genial manner and good business ability and public spirit have placed in a prominent and popular position. He is the owner and operator of a fine drug store in Nez Perce and is a leader in his line. Wilson Bowlby was born in Oregon, on the July 7, 1867, being the son of Theodore F. and Sophia A. (Adams) Bowlby. The father was a native of Indiana and crossed the plains with ox teams with his father, a physician seeking his health in the west. The family settled near Forest Grove and took land and the doctor opened a drug store in the town. Our subject was reared on the farms adjoining this town, gained his schooling there and learned the drug business from his grandfather. His grandfather was speaker of the territorial senate for seven years and a prominent man there. The mother of Wilson was a native of Ohio, crossed the plains with her parents in an early day and was married to Mr. Bowlby in Vancouver, Washington. In addition to the college course in the university at Forest Grove, Wilson studied dentistry for three years and later bought the drug store of his grandfather. This was in 1887 and that was the arena of his labors until August, 1896, when he came to the reservation, bought a relinquishment, and then practiced dentistry in Nez Perce for two years. The farm is near town and is still the family home. Then Mr. Bowlby bought the drug business of Eitzen & Towell, the pioneer drug store of the town, and building a commodious structure for the business, Mr. Bowlby has continued it since with ever increasing patronage. Mr. Bowlby is popularly affiliated in fraternal circles, being a member of the I. O. O. F. Morning Star, No. 56, of the K. of P., in Forest Grove; of the W. W., in Nez Perce, while he and his wife are members of the Methodist Church. Politically Mr. Bowlby is a staunch Republican and is always interested in any movements that are for the benefit of the County or town. On May 4, 1891, Mr. Bowlby married Miss Bertha E., daughter of Rev. J. W. and Sarah H. (Richie) Spangler, the wedding ceremony occurring in Hillsboro, Oregon. Mrs. Bowlby came to Oregon in 1882 with her parents. The father is a Methodist preacher located in Latah. 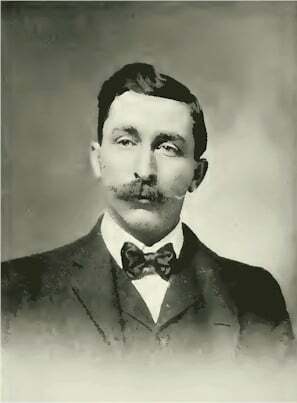 Washington, while his wife was state organizer for the W. C. T. U. of Oregon. Three children have been born to Mr. and Mrs. Bowlby, namely. Helen M., Ethel M. and Bert W. Mr. Bowlby has five brothers and three sisters, Charles H., at Hillsboro, Oregon; Theodore A., in Tillamook creamery: Randolph, Fred and George, all on dairy ranches and in partnership with Charles, and their mother resides with them; Emma M., wife of William Pitman, in Hillsboro, Oregon; Lois and Stella, living with their mother. Mrs. Bowlby has two brothers, James W., superintendent of Bradstreets agency in Seattle; Walter W., at Latah, Washington.